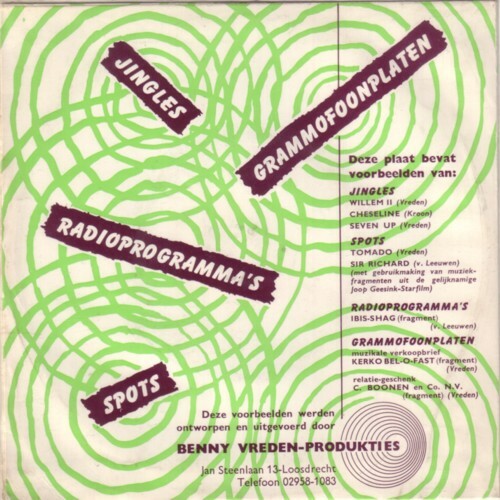 Some of the best Dutch advertisement records that were made in the sixties, were written and produced by Benny Vreden. He had a small studio, where he not only wrote, composed and recorded advertisement songs, but also complete sponsored radio shows, and everything that has to do with commercial music. Benny Vreden was very good at this. The studio still exists, and is now run by the son (and his partner) of the man who took over the business after Benny died, long time ago. But nowadays they mainly make music for schools. Benny Vreden started filling this non-commercial niche himself in the late sixties, and this proved to be very successful, up to this very day. When I contacted the Benny Vreden Studio’s recently, I hoped to get some answers on all kind of questions, and maybe some information that I didn’t even know of. I even hoped that there would be music in their archive that could be used for the CD’s that come with the book on Dutch advertisement records that I am currently working on. To cut a long story short: it turned out that they had no archive at all. 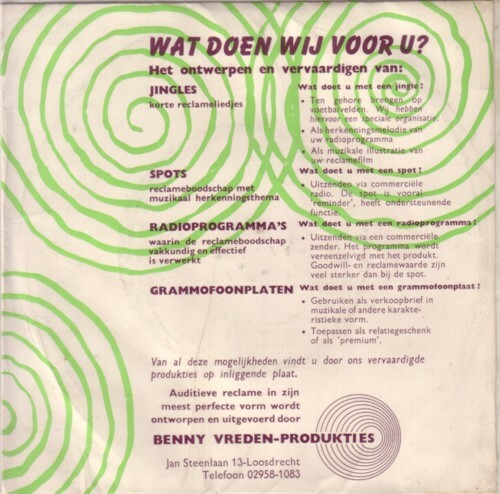 I have far more information and recordings of Benny Vreden than the Benny Vreden Studio’s themselves. I even promised them to make some CD’s for them with highlights from Benny Vreden songs, of which they hadn’t even heard. When I was nine years old my father took me to football stadiums. I have especially warm memories of the old wooden stadium of Blauw-Wit, that was located in the shadow of the Amsterdam Olympic stadium. I remember that there were advertisement songs played before, in between, and after the matches. Or actually, when I heard certain advertisement records, I remembered that I had heard these songs before, in stadiums. But I never found any reference to what advertisement songs where played in Dutch soccer stadiums in the sixties. I also remember that the audience sang along with certain advertisement songs, but I often doubt if this a true memory. I still hope to find out more detailed info on all this, or at least a meet a witness with a better memory than mine. And of course, I dream of ever having a CD with all the most played advertisement songs in Dutch soccer stadiums in the 60’s. Benny Vreden made these advertisement songs for stadiums. Maybe there were other companies doing it too, but he sure was the biggest name in this field. And in all other audio advertisement fields. But there is hardly any information to be found on all this. As if nobody cares! vandaag een sonopress-plaatje van Benny Vreden voor 20 cent op de kop getikt: kennelijk onderdeel van een campagne om kinderen hun tanden beter te laten poetsen, compleet met bladmuziek van het liedje.